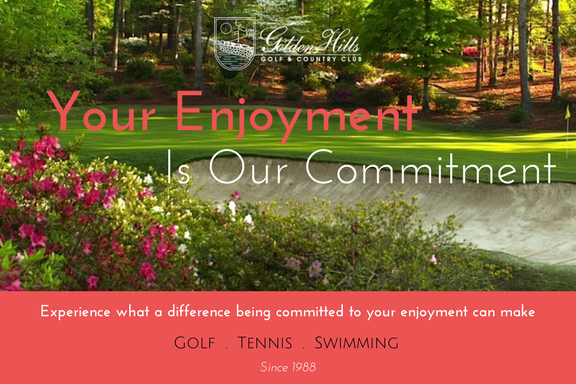 Established in the thriving heart of Lexington, South Carolina, Golden Hills offers the perfect setting for families seeking golf and country club amenities or a golf community to call home. Our 18 hole championship course is set upon a rolling topography which features beautiful trees and lakes throughout. In addition to great golf, the amenities include four lighted tennis courts, an outdoor Junior Olympic competition pool and children’s wading pool. The driving range, chipping area and putting green await your arrival for work on your game, at your convenience. Overlooking the property is the rustic and alluring clubhouse which houses the banquet facilities, Scottish tavern, golf shop and locker rooms. The professional staff at the club is dedicated to providing superior service and quality amenities for anyone seeking to experience Golden Hills. Experience Golden Hills to find your perfect fit for recreational pursuits and an unparalleled lifestyle.